This is my take on this week's Mystery Monday challenge at Club Anya & Friends. The image I used is from the Happy Day Stamp Set from The Greeting Farm. The base of my card is spring breeze backed in chestnut brown. I added brown chalk to the edges of the spring breeze. 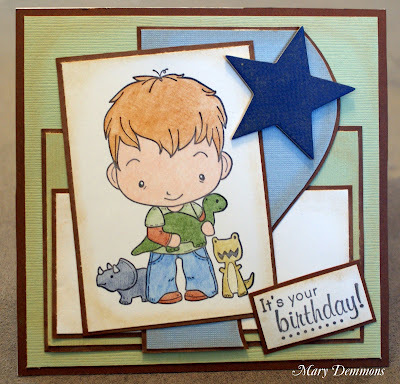 I cut strips out of white, spring breeze and pastel blue and added brown chalk to the edges of each. Then backed each one in chestnut brown. I also added brown chalk to the edges of the image and sentiment and backed it in chestnut brown. I added brown chalk to the blue chipboard star (it's hard to see in this photo) and added it to the upper corner of the card. Great card love the image it's not one I have seen before thanks for sharing it with us at Incy Wincy. Oh, I LOVE this, Mary! I'm so glad you could join us for the Kaboodle Doodles Challenge this week!